THERE ARE COTS AVAILABLE, AS LA MAISON CAN ACCOMADATE A SMALL BABY AS WELL, --NO CHARGE. A BATHROOM, WITH A BATH WITH SHOWER OVER, AND A TOILET AND WASHBASIN COMPLETES THE 1ST FLOOR. 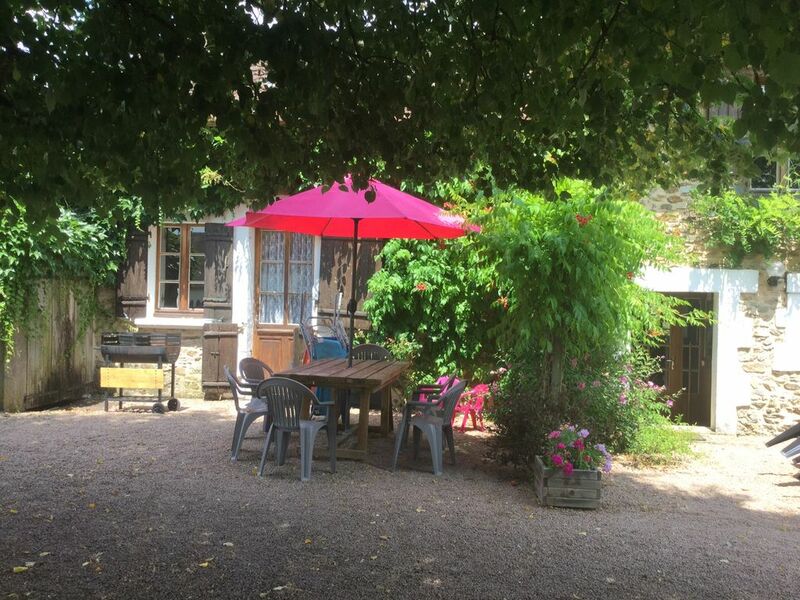 LA MAISON IS SITUATED IN THE SMALL HAMLET OF VIEILLE ABBAYE, WHICH IS ABOUT 3.5 KMS. FROM ST. JORY DE CHALAIS AND 8 KMS. FROM ST. SAUD LACOUSSIERE .IT IS IN THE "PARC NATUREL PERIGORD/LIMOUSIN. THE NEAREST TOWNS ARE THIVIERS(12KMS.) NONTRON(23KMS.). THE NEAREST CITIES ARE PERIGUEUX(45KMS.) AND LIMOGES AND ANGOULEME BOTH AT ABOUT 60KMS. IT IS BEST APPROACHED FROM THE N21--PERIGUEUX/LIMOGES ROAD. LIMOGES AIRPORT IS THE NEAREST(55KMS.) WITH BERGERAC AT 100KMS.--BOTH OF WHICH HAVE GOOD CAR-HIRS FACILITIES. THE AREA IS FAMED FOR ITS CUISINE, WITH MANY EXCELLENT RESTAURANTS SERVING REALLY GOOD VALUE FRENCH DISHES. THERE ARE 5/6 WHICH WE CAN RECOMMEND, AFTER MANY DELICIOUS MEALS EATEN BY OURSELVES OR CLIENTS. THERE ARE ALSO PIZZA' RESTAURANTS FOR THOSE WHO PREFER. THE LOCAL AREA IS IDEAL FOR WALKING,CYCLING AND HORSE-RIDING, WITH VERY FEW CARS ON THE ROAD, AND NUMEROUS PATHS AND TRACKS THROUGH THE FIELDS AND FORESTS. BRANTOME IS AOUT A 1/2 HOUR DRIVE AWAY, AND THERE YOU CAN EITHER HIRE A CANOE(SEATING 1-2-OR 3 PEOPLE) FOR AN HOUR, 1/2 DAY OR FULLDAY, OR TAKE A LEISURLY RIDE ON A BOAT WHICH TAKES YOU FOR A TRIP ON THE RIVER DRONNE. THERE ARE THE LOCAL CAVES AT VILLARS, AS WELL AS A CHATEAU AND RUINED ABBEY. 3 LOCAL SWIMMING LAKES:-- ST SAUD(8KMS), ST MATTHIEU(24KMS. )AND BUSSIERE(24KMS.) --WHICH ALSO HAS A ROPES COURSE TENNIS COURTS, AND VELO-RAIL. TENNIS COURTS ALSO AT ST. SAUD . GOLF AT PERIGUEUX AND LIMOGES. LOCAL MARKETS :--PIEGUT - -WEDNESDAYS .